Getting shredded is all about hard work in the gym and in the kitchen but the right supplementation can fast-track your results from good to “Why do I even own a shirt?” great. There are no shortcuts to getting lean. If you’re slacking in the gym, making excuses and cheating on your diet, you can’t complain about not seeing the results. But if you’re sticking to your meal plan 90% of the time and consistently smashing your training sessions, supplements can step it up a level to help you achieve your desired physique faster. Maximise your training while enhancing recovery with BCAAs, so you can train harder and be back in the gym sooner. Taking a BCAA supplement before and after every workout can significantly reduce post-workout muscle soreness – vital when you’re trying to maintain a rigorous training schedule. Branched Chain Amino Acids (BCAAs) consist of three essential amino acids leucine, isoleucine and valine, which make up about 35% of your muscle mass. They help to activate protein synthesis and also diminish muscle protein breakdown. For this reason, BCAAs are well known for helping bodybuilders and athletes cut body fat while retaining their muscle mass, even when in a calorie deficit. BCAAs can improve performance levels by enhancing endurance and decreasing symptoms of fatigue. BCAAs can be burned as energy to maintain ATP energy levels during glycogen-depleting exercise, and may also help to prevent fatigue of the nervous system by blocking entry of fatigue-inducing tryptophan into the brain, allowing you to get more out of every workout. When you’re smashing it in the gym day after day, you’re placing your body under an enormous amount of stress and are more susceptible to muscle recovery issues and illness. BCAAs provide much-needed support to the immune system, important for anyone undertaking strenuous training. Pro Tip: BCAA 4:1:1 100% pure Branched Chain Amino Acids taken twice daily for optimal protein synthesis and muscle conservation. While following a calorie-restricted diet, it’s imperative to ensure you’re still obtaining all the necessary vitamins and minerals. If you believe your diet is lacking, a quality multivitamin can top up your daily dosage of micronutrients to maintain optimal health during your cutting phase. Any deficiencies will only compromise your training and your results. Pro Tip: A good quality multivitamin taken daily, in combination with a nutritious diet high in a variety of fresh, whole foods. Glutamine is the most abundant amino acid in muscle, contained in over 61% of skeletal muscle, but levels can be depleted by as much as 50% after a strenuous workout. Since the body relies on glutamine as a major source for ATP and for healthy immune function, this can impact severely on energy levels, strength, stamina and recovery if not replenished. After a workout your body is thrown into a catabolic state in which it breaks down muscle tissue to replace lost glutamine. Studies show that supplementing with glutamine can offset this, helping to minimise breakdown of muscle and improve protein synthesis. A number of studies suggest that L-Glutamine supplementation can have a significant impact on GH levels, which helps metabolise body fat and support new muscle growth. With its ability to improve GH levels, plus its anti-catabolic benefits, glutamine is an excellent choice for preserving muscle while dieting. Pro Tip: Glutamine Recovery Fuel taken at key times – during or directly after intense exercise, and before sleep – to support recovery and fight catabolism. Anyone involved in fitness knows the importance of protein. During a dieting/cutting phase, ensuring adequate intake of the amino acids needed for building and maintaining muscle tissue is essential. The unbeatable biological availability of whey protein makes it the ideal choice. Whey protein has an excellent amino acid profile containing all essential amino acids, which is especially important during periods of calorie restriction so that your body doesn’t break down muscle to obtain them. Maintaining a high protein intake throughout your shred will ensure you maintain muscle while losing fat, and therefore maintain a high metabolic rate to help you cut quicker. A protein supplement will also assist with satiety, helping you to fight those hunger cravings while on a limited calorie intake. Pro Tip: 100% Premium Whey is an ideal low carb, low fat protein to support lean muscle growth and recovery. Take post-workout to aid recovery and as a high-protein, low-calorie snack between meals. L-Carnitine is well known for its performance-boosting and fat-burning properties and can significantly boost your results during a cutting phase. Supplementing with L-Carnitine helps the body with mobilisation of fat stores by assisting transportation of long-chain fatty acids to be oxidised for energy during a workout. Without adequate levels of L-Carnitine, most dietary fats can’t get into the mitochondria of the cell and be burned as fuel during exercise. While cutting, it is not uncommon for performance levels to drop as a result of a calorie deficit and the corresponding lack of energy. L-Carnitine helps improve muscular endurance by inhibiting the build-up of lactic acid and helping the body to burn more fat for fuel while sparing muscle glycogen. Pro Tip: Vitalstrength L-Carnitine Powder in Wild Berry mixed with water and taken 20mins before exercise to help mobilise fat stores, boost energy and aid performance. Creatine can offer incredible benefits when trying to cut body fat because it allows you to maintain strength, even when glucose levels are extremely low. While creatine is principally known for its muscle-building properties, essentially its benefit lies in increasing energy. It gives you that extra boost of short-term energy needed to maintain a higher level of intensity during workouts – exactly what you need when you’re in an energy deficit. Some steer away from creatine while cutting as it can cause “bloating”, however this is largely a myth and based on some very old and questionable research. Sure, creatine can cause some water retention, which is held mostly within the muscle and will add definition rather than bloating. Pro Tip: Typically between 3-5g Creatine Monohydrate taken 1-2 times daily to help maintain strength levels and muscle mass throughout your cut. 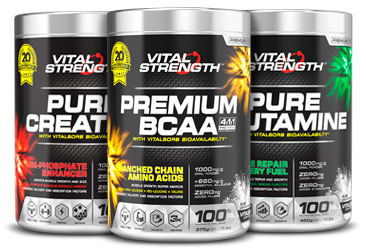 Vitalstrength Creatine Monohydrate uses only certified and pharmaceutical grade ingredients, and is enhanced with Vitalsorb technology for optimal mixability and solubility. Once you’ve mastered the all-important basics of training and nutrition, adding these supplements into your routine should help to boost your results and reach your fat loss goals faster. Happy shredding! Want to shred fast? 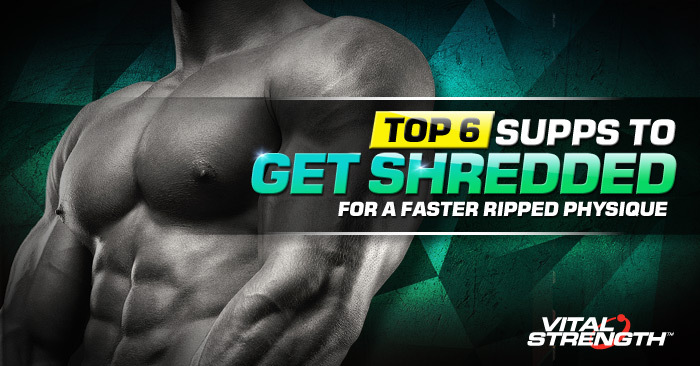 Fast track your results with the help of the top 6 supplements to help get shredded with a lean and ripped physique.